Macro Shooting as Close as 2"
Nikon's Coolpix S4300 Digital Camera (Black) has everything you need in a compact camera, all beautifully contained in a stylish little pocket-sized package less than 1" thick, and weighing in at only 5 oz (139 g). Start with a serious 16MP CCD sensor for great image quality, add a sharp 6x wide-angle Nikkor 26-156mm (equivalent in 35mm format) lens and a brilliant 3" touch screen LCD display with 460K-dot resolution--you can focus by just touching a point on the screen. The S4300 isn't just another pretty face, either--it's got one-touch 720p HD video, optical VR image stabilization to capture crisp, sharp images and reduce blurry pictures, sensitivity up to 3200 ISO that lets you keep shooting even when it gets dark, Subject Tracking Autofocus that locks onto a moving subject to keep it in focus at all times and a Macro mode that produces fantastic pictures by focusing as close as 2" from the lens. The Smart Portrait System makes every person you photograph look good, by automatically capturing a smile, warning you when someone blinks in a picture, automatically correcting red-eye and smoothing out wrinkles and blemishes on faces. There are 20 scene modes, including Scene Auto Selector which automatically optimizes the camera settings for best results. Nikon has equipped the Coolpix S4300 with a 16.0-megapixel CCD sensor that assures exceptional image quality. It's paired with a 6x wide-angle optical Zoom-NIKKOR glass lens that offers you excellent compositional freedom. Nikon's true glass lens boasts a focal length from 26-156mm, a range that zooms in for your best portrait shots and has a wide angle to cover beautiful landscapes. The COOLPIX S4300 even has 20 Scene Modes, including Scene Auto Selector, so you can leave it to this intelligent camera to automatically determine what type of photo you're taking and adjust the setting to assure a flawless photo every time. And just when you think this camera is maxed out with features, its formidable movie recording capabilities capture all the action in 720p HD. If you love fingertip operation with a cool, intuitive graphic interface, wait 'til you start taking photos with the COOLPIX S4300. The camera's clear, bright, three-inch touch screen LCD monitor comes alive with 460,000-dot detail. In shooting mode, Touch Shutter lets you choose a focus point simply by touching any part of the frame. There's also Touch AF/AE (Auto Focus/Auto Exposure) for convenient auto focus by touch. Plus, with Subject Tracking, you can touch any subject on the display and the COOLPIX S4300 will follow it through the frame. The COOLPIX S4300 provides touch control in playback with features such as Paint Functions and Slide Show, which offers fun "character" effects and Image Scrolling. The COOLPIX S4300 is also equipped with several filter effects that let you add a personal touch to your photos and include Soft Focus, Selective Color, Color Options, Fisheye, Miniature, and Cross Screen. Staying connected means sharing life's happiest and most poignant moments with people you care about-and HD movies help make that possible. 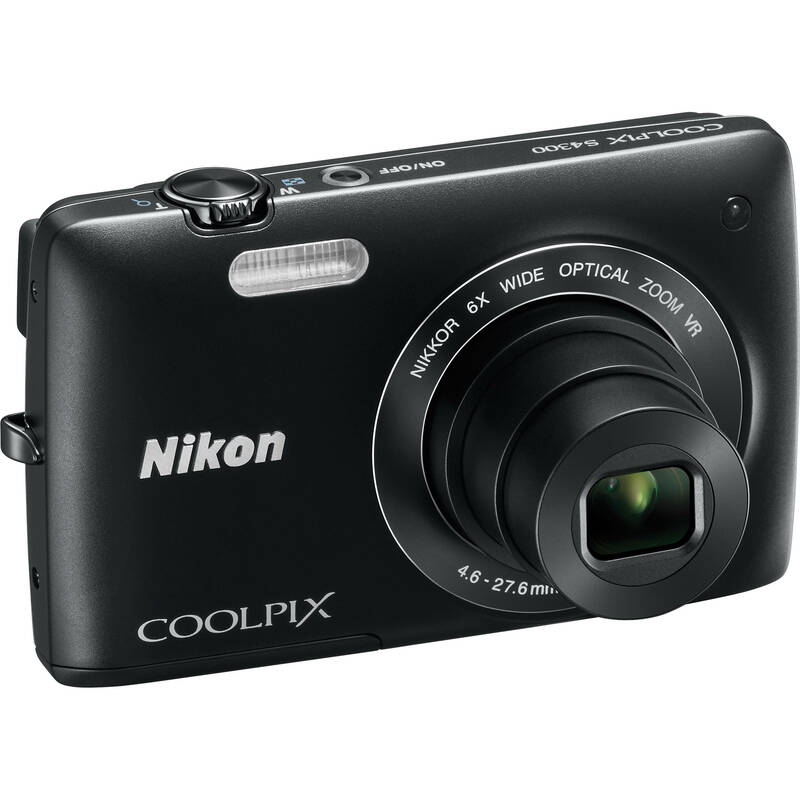 The COOLPIX S4300 is the full-featured camera you'll want for shooting high quality HD 720p movies. With One-Touch recording, movie making has never been easier. Digital zoom allows you to get close to the action whether you're at sporting events, beach parties or music concerts. And since the compact COOLPIX S4300 has pull-from-your-pocket, easy-to-carry convenience, you can shoot college graduations, birthday toasts and other once-in-a-lifetime events discreetly, so the action is always spontaneous and memorable. When your movie is complete, watching and sharing it is also simple, with in-camera playback. Or, you can opt for playback on your TV or computer. Imagine an affordable, compact camera that's also smart enough to automatically correct for camera shake, take a series of shots and save only the sharpest ones, or intuitively adjust shutter speed when you're focused on moving objects. The remarkable COOLPIX S4300 does all that and much more. It's equipped with an optical VR Image Stabilization system that minimizes blurred images. Its Motion Detection identifies moving objects and adjusts both shutter speed and ISO to create optimal settings to achieve the best picture. With the COOLPIX S4300, Nikon has thought of everything. When you're shooting in low-light, you're sure to get optimum results with high ISO speeds up to 3200. This innovative camera is ready to take on your imagination. The COOLPIX S4300's Smart Portrait System includes Smile Timer, which automatically recognizes when a subject is smiling and releases the shutter. Face-Priority AF finds and focuses up to 12 faces. Blink Warning alerts you when your friends may have blinked. What's more, in-camera Red-Eye Fix corrects most instances of red-eye, while Skin Softening smoothes skin tones. The COOLPIX S4300 also has macro shooting capabilities as close as 2 inches and a supplied EN-EL 19 Li-ion rechargeable battery for approximately 180 still shots. First It Turns Heads … Then It Shoots Their Pictures. With its rounded body and sleek lines, the ultra-light COOLPIX S4300 is a favorite choice of the stylish and design-conscious. But while this camera is full of personality, it's also packed with versatile Nikon features that make it an ideal everyday camera. Slip the COOLPIX S4300 into your purse or coat pocket. At 0.9 inches thin and a feather weight 5 ounces, you'll hardly know it's there, and yet it's ready to shoot high quality stills or HD movies at a party, on the beach or at a ballgame. You live life in high gear. You deserve a camera that keeps up with you every step of the way. Box Dimensions (LxWxH) 7.8 x 5.3 x 3.4"
Coolpix S4300 Digital Camera (Black) is rated 4.5 out of 5 by 38. Rated 5 out of 5 by Vijay from B & H are professionals in handling cust I ordered Nikon Coolpix 4300 (will write a review on the camera next) late evening 4/2, the next morning I got an e-mail from B & H that the order has been shipped and expected date is 4/2 by UPS. I tracked the order on UPS site on 4/5 but the status was updated with arrival date as 4/5, was disappointed as it was a gift to my niece, called B & H Customer care, the guy was very polite and said 'Do not worry abt the status on UPS but you will receive end of day today'. Surprise!! Got it on time on the day expected. B & H has a wonderful tool that compares multiple cameras (or other products on sale) across brands selections and features, an amazing option for newbies on camera. Nikon Coolpix 4300 simple point & shoot camera, with great picture quality and simple to handle, it LCD is wide and touchscreen that makes user to move pics/video . I just love this camera and appreciate B & H for making our day!! Rated 5 out of 5 by Hugh from Great everyday camera! I have a Nikon digital SLR with all the extras and love it but it is too heavy, bulky to have all the time and the little Coolpix S4300 fits into my pocket and is handy for those times that I don't feel like carrying the big camera bag. It's there when I need a camera. Fast, easy to use and a big viewing area, love it. Rated 5 out of 5 by Doc from Nikon is the best Bought this as a gift for my wife to replace an older Panasonic Lumix that needed repairs. We already own a Nikon D-60 digital SLR that we use for family and professional photography, but we've always kept a digital point and shoot as a back up. This camera is by far more easy to carry, and yet has many of the features of our larger Nikon. The lens was a wider angle than the old Lumix, which will really come in handy for landscape vistas we shoot in National Parks. We were very pleased with the product, and with B&H's quick turn around and pricing. Thanks for a great online purchase experience. Rated 5 out of 5 by Rah Rah Ruth from Easy cool I've only owned this for a short time but I was able to use the features immediately. Its compact design allows it to fit snugly in even a small purse so I'm reasdy to take pictures at any moment. Rated 2 out of 5 by Ana Vras from Great Price but not so god pictures I bought this camera to use in my trip to Orlando. I am not use to little cameras. I have a Canon 60d so I am used to a more professional equipment. I needed something small to take pictures in the Parks. The Coolpix S4300 is a interesting camera because it has a easy interface, is very small and has a very good price. But it takes too long to capture an image, is difficult to focus in what you want and don't have a night picture module. The only way to take picture in the dark is changing to a more sensitive ISO. And it can take a while to make any changes in the flash module or even in the ISO. So you can loose interesting moments while you try to find the right way to capture your image. Its a good equipment for daylight pictures.